“I’m proud to say, ‘Yes, I do,’” he proclaimed last night to thunderous applause. Bauer, a speaker at Coatesville Area Senior High’s 134th commencement, energized an already exuberant crowd with a humorous take on his high school experience. To those who thought the time flew: “It doesn’t seem like yesterday,” he insisted, pointing out that 720 days had elapsed. 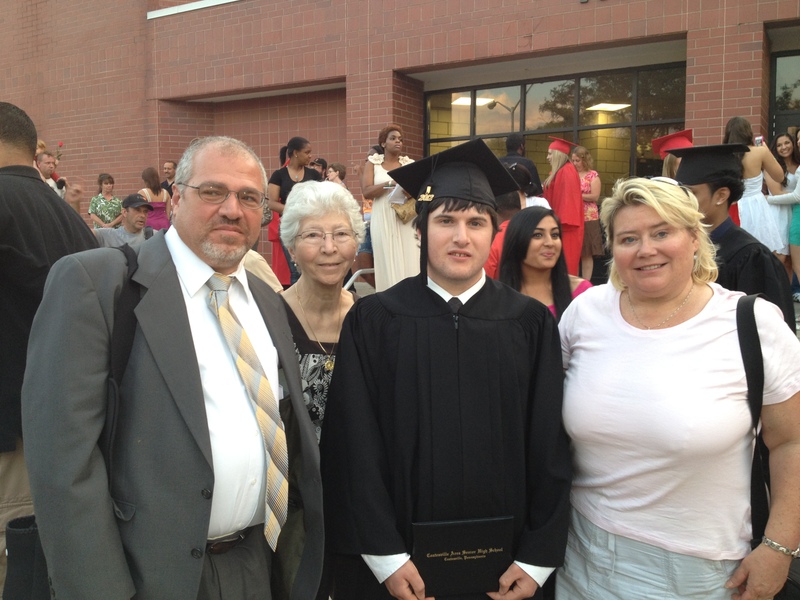 Tony Cordaro (from left), his mother, Nina Cordaro, and his wife, Nancy, celebrate their son Kyle's graduation. In a gymnasium bursting with pride as well as people, Bauer continued a tone set by Superintendent Richard Como. 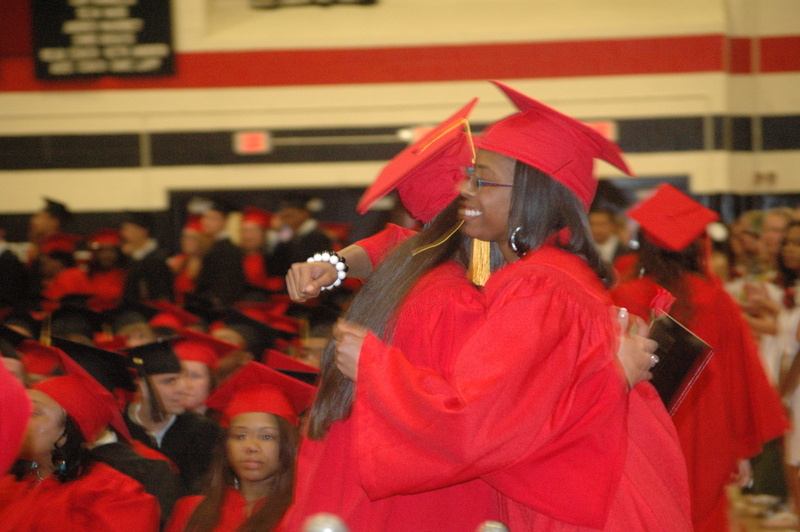 “There is only one Coatesville and now it is yours,” Como told the 544 graduates, urging them to leave their egos at the door and go out and make a difference. “Our job is not to hold onto our positions; our job is to improve things,” he said. After inclement weather interrupted last year’s commencement, forcing everyone inside, the threat of rain prompted officials to hold the ceremony to the gym with overflow seating in the auditorium. 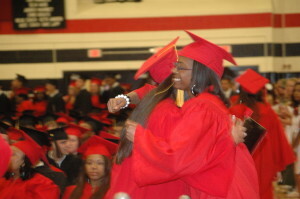 Coatesville’s colors dominated the space with alternating rows of girls in red caps and gowns and boys in black. Around the perimeter of the seats, 11th-grade honor students served as ushers, nattily attired in black and white accented by red flowers. In the stands, relatives and friends juggled balloons, flowers and cameras. 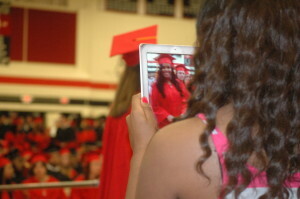 A spectator uses an iPad to snap a photo of a graduating senior. But, long after the last diploma was distributed, many graduates and family members lingered for hugs, photos and reminiscing. Nancy Cordero, who, along with her husband, Tony, and his mother, Nina Cordero, watched their son Kyle graduate, said she was impressed with the ceremony as well as the school system. Her views were shared by Deb Pieri, who risked traffic to run across the street to catch one of the departing teachers. She wanted to thank him for all he had done for her son, Jeb Broughton, and snap one last photo. “That was Dave Sheller, who teaches AP Calculus; he’s just fabulous,” she explained. 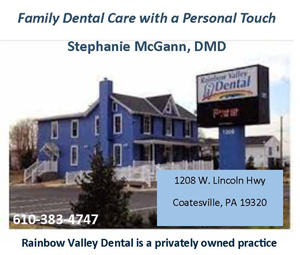 Pieri, herself a Coatesville grad, said she used to teach elementary school in the district and was delighted with the positive experiences her son, a scholarship winner, had in both middle and high school.